Tooth fillings are dental treatments that have preventative, restorative, and cosmetic benefits. They are a popular choice because they imbue beauty and function in one treatment. At Forster Dental Centre, teeth imperfections such as cracks are easily solved with tooth coloured fillings. So you can be back to your regular oral functions without sacrificing beauty! Tooth filling is a tooth coloured resin bonded to the affected tooth to solve dental issues. The materials are durable so your teeth’s functions won’t be hampered. As mentioned, tooth fillings have preventative, restorative, and cosmetic benefits. The last listed benefit is in respect to the dangers posed by Mercury content in amalgam fillings. We at Forster Dental Centre push to maximise patient safety in all our dental procedures. There are different types of tooth fillings. The materials used vary depending on the location. 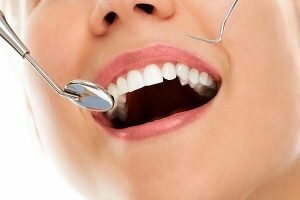 Front teeth fillings – If the fillings are to be applied in the front part of the mouth, the recommended filling is composite or tooth coloured. Back teeth fillings – If the fillings are to be applied in the back of the mouth, such as the molars, the recommended filling is silver. Silver can withstand heavy chewing and grinding. Ideal candidates for tooth fillings will undergo a carefully designed process. Each step ensures patient safety and comfort. Your teeth are cleaned as preparation. For a tooth with decay, the decayed parts are removed and the tooth is thoroughly cleaned. The tooth is kept dry from saliva using a dental dam. The filling is applied, shaped and bonded. An ultraviolet light hardens the bonded filling during the curing process. We have an extensive range of dental services to fit all your dental needs. Your trusted Forster Dental Centre dentist will be with you every step of the way to make sure that you get the best there is. Start your oral health journey with us!